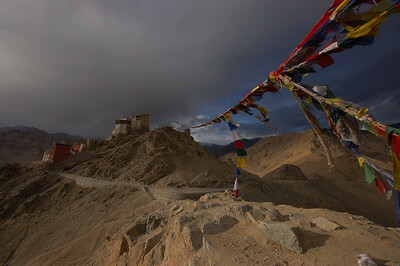 We spent 23 days in Ladakh, with 12 nights in Leh, the biggest town in Ladakh, with just under 30,000 inhabitants. We spent more nights in Leh than we'd spent in one place since we began our trip almost 8 months ago. When we came back from an excursion, I was excited to get back to our familiar guest house, have a tea and Ladakhi flat bread for breakfast, lunch with Yann and Jochen and relax the time in between meals. Our arrival in Leh coincided with a visit by Ladakh's head lama who was giving a series of talks at the monastery just down the street from our guest house. 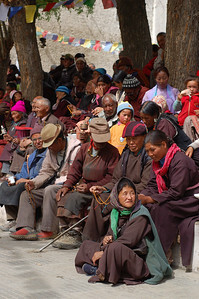 His talks attracted crowds of pilgrims who sat outside listening to his microphone enhanced speeches while drinking butter tea and spinning their prayer wheels. I lasted less than an hour at the prayer session, there's only so much monotone Ladakhi chanting one can stand. Many of the pilgrims were taking naps or socializing so I didn't feel too bad about my short visit. 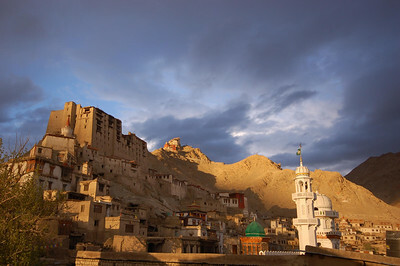 Leh is surrounded by a dry barren landscape, and it's character is defined by the massive, crumbling Leh Palace and Monastery overlooking the town. Yann and Jochen made me climb up to them. Adding to the feeling that you're stuck in a time warp are the traditional Ladakhi clothes, sported by most of the older Leh residents. The men's wear is a bathrobe like maroon coat, tied around the waist with a rope. 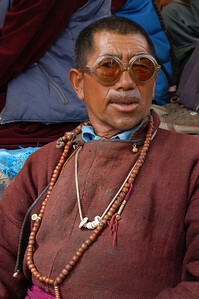 The woman wear a full length brown or maroon wool dress with lots of turquoise and coral jewelry, their hair grown long and worn in two braids. To complete their outfits they wear felt slipper like shoes with turned up pointed toes and are usually holding prayer beads. 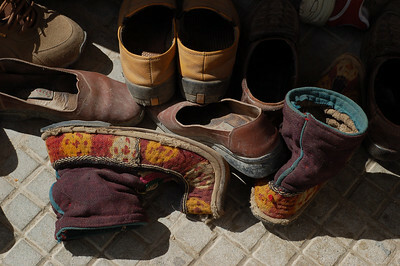 Younger Ladakhis are encouraged to wear traditional clothes, but the big city Leh kids mostly wear jeans and a t-shirt. There is also a sizeable Muslim population in Leh, who add a kufi (muslim skull cap) and a long beard to the Ladakhi ensemble. The number of tourists in Leh increased every day, with more and more restaurants and travel agencies opening up for the season. It was actually a much more interesting place without tourists. In the busy season Indian and Kashmiri store owners make the journey to Leh to open up their seasonal shops. When we first arrived the only shops and restaurants doing business were Ladakhi, it felt more like every day Leh life, the life that is lived 8 months of the year. Apparently, during peak season every single pack-horse in Ladakh is rented out to trekking porters and the price at our guest house rises to 3 or 4 times what we were paying. To help me get over my fear of flying we left on the inaugural flight from Leh(completely surrounded by large mountains) on a budget Indian airline. To our pleasant surprise we arrived safely in Delhi an hour after departure. We had weren't able to get a place on the train towards the Nepalese border until the next day. Jochen and I bullied Yann into letting us go to McDonald's for our last dinner together. McDonald's in India is terrible value and doesn't really taste that good, but the desire for familiarity had really gotten to me. The next day we began our exhausting journey to Kathmandu, starting with a night train to the city of Gorakhpur, sitting right in the middle of the blistering hot Indian plains. We arrived there before lunch and managed to get on a bus heading to the border town of Sonauli, about 3-4 hours of sweaty, crowded bus riding away. 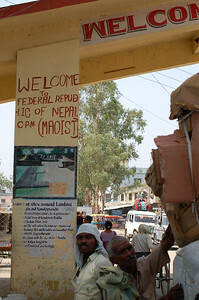 The Indo-Nepali border is completely open, Indians and Nepalis crossing back and forth without hassle. We walked right by customs and could have entered Nepal without anyone uttering a word to us. Once on the Nepali side, applying for our visas, another couple of tourists sat down and started filling out forms, thinking they were still in India. It took about 5 minutes to process our visa applications and stamp us into Nepal, easiest border crossing yet. We now had to travel through our second night in a row, by bus to Kathmandu. We had a few hours of waiting in the oppressive heat of the Nepali Terai (Nepal's version of the Indian plains). We haven't yet been to an appealing border town and here was no exception. Sitting outside the bus ticket office, we noticed a young man lying on the ground nearby, he looked incredibly sickly. He was covered with flies, dirty and emaciated, he was breathing, but it seemed that he was doing so with great difficulty. We finally asked the men at the bus ticket office if an ambulance needed to be called, or if something could be done but things aren't so simple here. Nobody would call an ambulance, we are assuming because they aren't free. We would wait until the man died because then "the police will come and get the body, he's almost dead anyways". According to the locals, the dying man/boy was a drug addict, who they had previously attempted to help, his arms and body appeared to be covered in needle marks. In a place where people are barely scraping by themselves, locals viewed giving him money as a waste, at least, that's how they defended their inaction. He died a few minutes later, although no one would confirm it, and after some hesitation I built up the courage to check him for a pulse, there was none. Then someone called the police and we got on the bus to Kathmandu. Afin vous prenez un "break", cela fait du bien de vous voir un peu plus relax. Il me semble que depuis que vous etes partis, c'est une course contre le temps. Comme d'habitude Emilie, tu nous decris toujours aussi bien vos experiences et bien attendu Yann, tes photos sont toujours aussi belles et pour tout dire vraiment tres belles. On vous embrasse tres forts. Fier de ton bon sens d'humanité Émilie.